A new book by Genevieve Davis, about her other Grandmother! A collection of delicious, Austrian recipes from Fanni Baier for Apple Strudel, Plum Kuchen, Strawberry Cake, Rumbombe, Plum Dumplings, Wienerschnitzel, Sauerbraten and more! And a collection of stories of Fanni's immigrant life in America and how she met the challenges of the Depression and World War II with food. Also how Fanni got her glamorous daughter out of hot water and "saved her from a monster." 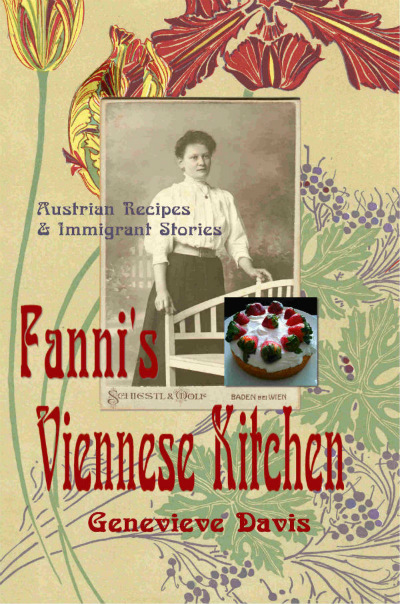 And the author's life as Fanni's granddaughter, growing up in the peace and order that Fanni created with her cooking and Austrian way of life. This was a favorite of the Emperor Franz Josef, the ruler of the Austro-Hungarian Empire. The Emperor had humble tastes, which included not only this stale bread dish, but also sleeping on a military cot in his office. Take stale bread and tear into pieces. Dip in French toast batter. Pan sauté in butter or oil of your choice. You can fry up peeled apple slices in the pan at the same time. Serve up all with powdered sugar and cinnamon sprinkled on top. When my mother was a teenager in Milwaukee, she was too embarrassed to bring her friends over to witness the homey scene, taking place in the dining room at Fanni’s. Her father, Johann and their boarder Uncle Herman, both out of work, would be sitting on either side of the table in their sleeveless undershirts. While reading the German newspaper, Johann would be paring an apple, and bringing the knife with the slice on it to his mouth with his thumb, or scooping bacon drippings out of a old can and spreading it on a piece of rye bread. Herman worked laboriously on his stamp collection, mounting stamps into a big book. Her mother, Fanni, sat at the far end of the dining room table, by the kitchen, where she sprinkled clothes, knitted mittens, darned the family’s socks, embroidered pillow cases, and kept her account books for the household. All the while they were sitting around the dining room table, they spoke to each other in German. Apparently, my teenage mother never saw the glamorous people she idolized in movies acting like this. Ach du lieber!